Rules apply to help ensure healthy and sustainable fisheries for future generations. Abiding by the rules will help preserve our saltwater recreational fisheries. Plan your activity well in advance and ask about restrictions or closed areas at your local NSW DPI Fisheries Office. All fin fish and invertebrates (such as crabs, prawns, worms, nippers, cockles and squid) are subject to bag limits and many are also subject to size limits. The table provides a maximum of each gear type permitted per person in use or in possession at any time. All of the above recreational fishing equipment has additional restrictions and requirements that must be adhered to. * A gang of hooks should have no more than 5 hooks. No more than 3 trebles attached to a lure. # This gear must be used by the method of hang jigging only. This line is included in the total number of lines permitted as given above. A maximum of four rods or lines can be used by any one person at any one time. If any rods or lines are left unattended, they must be clearly marked with the fisher’s name and address or name and boat registration number. A maximum of three hooks or three gangs of hooks can be attached per line. A gang of hooks should have no more than five hooks. One line may have six single hooks with a lure attached to be used by the method of hand jigging only. A maximum of three treble hooks can be attached to a lure. Hand picking may be used to take fish, gloves are permitted. A single blade knife with a blade longer than it is wide may be used to help gather invertebrates. Pliers may be used to help gather invertebrates except on rock platforms. Hand (nipper) pumps are commonly used to collect saltwater pink nippers. Barrel diameter not to exceed 85mm. May only be used as an ancillary aid for retrieval of fish caught when line fishing. You can only use or have in possession one trap at any one time. 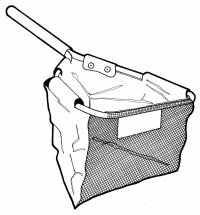 The maximum dimensions of a bait trap are 450mm length x 350mm diameter with entrance funnel no larger than 60mm in diameter. 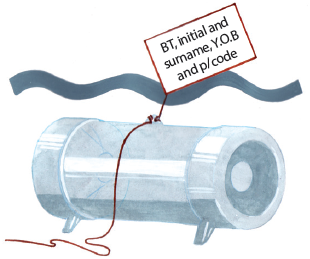 The trap must have a tag attached to a part of the trap which is at or above water level with dimensions not less than 80mm x 45mm,with BT, initial and surname, year of birth (YOB) and postcode of the person who sets, uses or lifts the trap, all letters to be a minimum of 15mm and in a colour contrasting to the tag. Not more than ​4 nets are to be used (or in possession) by any one person at any one time. 1 or 2 hoops per net (no rigid frame between them). Diameter of hoops should be no greater than 1.25 metres. Mesh size cannot be less than 13mm measured across the diagonal. Drop (length of net) should be no more than 1 metre. A float/ buoy to be labelled with HN, initial and surname, year of birth (YOB) and postcode of the person who sets, uses or lifts the fishing gear. The minimum height of the float being at least 50mm above the water with all letters to be a minimum of 15mm and in a colour contrasting to the buoy. The float/ buoy must measure not less than 100mm in all dimensions. Hoop nets or lift nets must not have any rope floating on the surface of the water. The net must be dropped and raised vertically through the water by hand. The net must not be used in ocean waters. Any rock lobsters or fin-fish (which are subject to a size limit) must be immediately returned to the water unharmed if caught. Do not set gear in areas of high boat traffic or navigation channels. Not more than 1 spanner crab net can be used by a person at any one time. 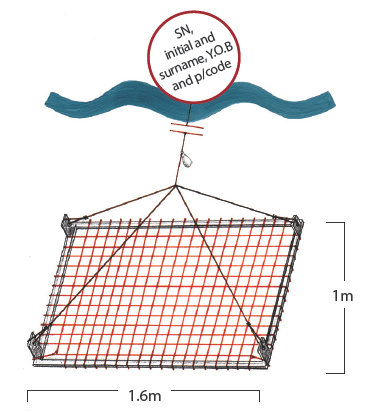 Net must be attached to a rigid frame not exceeding 1.6 metres in length and 1 metre in width. 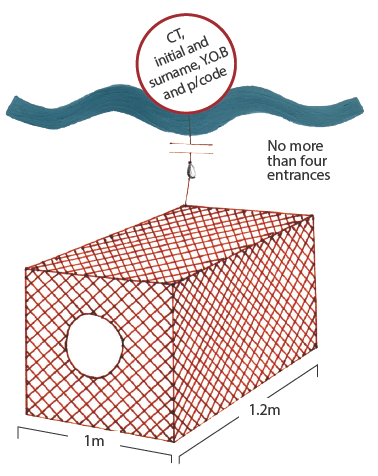 Net must not be capable of extending more than 0.1 metre beneath the frame when the frame is suspended in a horizontal position. The net must be lowered and raised through the water only by hand. Only to be used for taking of spanner crabs. May only be used in ocean waters north of Korogoro Point (Hat Head). 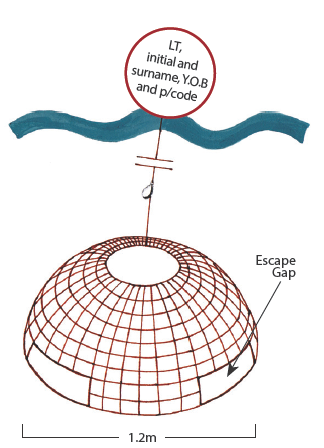 A float/ buoy to be labelled with SN, initial and surname, year of birth (YOB) and postcode of the person who sets, uses or lifts the fishing gear. The minimum height of the float being at least 50mm above the water with all letters to be a minimum of 15mm and in a colour contrasting to the buoy. There must also be a 50 gram weight attached to the float/buoy line so that no line is floating on the surface of the water. Not more than 2 traps to be used (or in possession) by any person at any one time. Maximum dimensions - 1.2 metres (length) x 1 metre (width) x 0.5 metre (depth) or has a diameter not exceeding 1.6 metres at the top or bottom. Minimum mesh size - 50mm. No more than 4 entrances (none of which are on the top of the trap). A float/ buoy to be labelled with CT, initial and surname, year of birth (YOB) and postcode of the person who sets, uses or lifts the fishing gear. The minimum height of the float being at least 50mm above the water with all letters to be a minimum of 15mm and in a colour contrasting to the buoy. There must also be a 50 gram weight attached to the float/buoy line so that no line is floating on the surface of the water. Must not be made of entanglement material. Must not be set to impede the free passage of fish. Any fish caught (other than crabs) must be returned to the water. Not more than one trap is to be used (or in possession) by any person at any time. The base or floor of the trap may be either rectangular or circular. Rectangular not exceeding 1.2 metres by 1.2 metres. Circular not exceeding 1.2 metres in diameter. A float/buoy to be labelled with LT, initial and surname, year of birth (YOB) and postcode of the person who sets, uses or lifts the fishing gear. The float being at least 100 mm in diameter and 50 mm above the water with all letters to be a minimum of 15 mm and in a colour contrasting to the buoy. There must also be a 50 gram weight attached no less than one metre below the buoy so that no rope/line is floating on the surface of the water. Escape gaps are required. Either: One gap not less than 57 mm high x 500 mm wide; or two gaps not less than 57 mm wide x 250 mm wide; or three gaps not less than 57 mm high x 200 mm wide so that no part of any escape gap is more than 12 cm above the floor of the trap. Lobster traps must not be used in inland waters or any waters more than 10 m deep (contour). Only Rocklobsters can be taken with this trap. Maximum length of 6 metres. Mesh size between 30mm-36mm measured across the diagonal. Must not be staked or set, or joined or placed with any other net. Must be continuously and manually pulled through the water and not used as a stationary net. Hauling lines of up to a maximum of 2 metres in length may be used. Any fish caught which are subject to a size limit must be immediately returned to the water unharmed. Length of the lead or bottom line between the ends of poles must be no longer than 2.75 metres. Must be continuously and manually propelled and not used as a stationary net. Must be operated by one person only. Only one net per person is permitted at any time. Maximum diameter of hoop or ring 0.6 metres. Minimum mesh size 20mm measured across the diagonal. 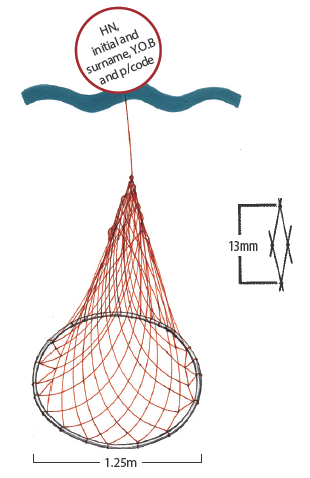 Drop (length of net) no more than 1.25 metres. Must be used by hand and not staked or set. Must not be joined or placed with any other net. Only one net per person at any time. Other fish caught while fishing for prawns may be kept, however, bag and size limits apply. Fish in waters that are closed to fishing. Use any methods/gear to take fish or invertebrates that are not specified in permitted methods. Take or be in possession of fish or invertebrates in excess of the bag limit or of a size outside the legal size limits. All prohibited size fish must be released immediately. You must not hold prohibited size fish or fish in excess of the legal bag limit in a live well or use them for bait even if they are injured or dead on capture. 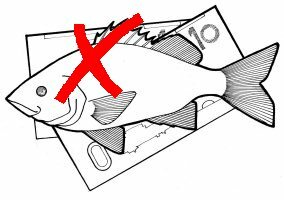 If you have purchased fish or bait from a commercial vendor, retain the receipt to present to an I&I NSW Fisheries Officer. Take, attempt to take, harm or be in possession of threatened or protected species. Use a chemical or explosive device to take or assist to take fish. 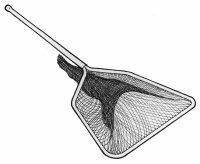 Use a cast net in NSW waters. Possess excess fishing gear in, on, or adjacent to waters. Interfere with commercial fishers or fishing gear. Alter the length of a fish or invertebrate by filleting/ shucking and/ or removing the head/ shell until well away from the water. This rule does not apply at areas normally used for cleaning fish such as boat ramp cleaning tables, if the fish are for immediate consumption or immediate use as bait, or for fish that do not have a legal length. You may clean fish by gilling and gutting only. Trans-ship fish from one boat to another (except specified bait species, squid and cuttlefish for use as bait only). Carry excess fishing lines in, on, or adjacent to waters. Spare lines should not be rigged and should be properly stowed. Jag fish (hooking or attempting to hook fish other than in through the mouth). Use drift lines. Lines must be held in the hand or fixed to a boat or the shore. Use abalone gut as bait. This is due to the AVG virus. Use hammers, mattocks, chisels, crowbars, dredges or other instruments not specified in permitted methods. Retain lobsters or crabs carrying eggs, they must be returned immediately to the water. It is an offence to remove any eggs. Retain any rock lobsters caught whilst line fishing. Collect invertebrates within Intertidal Protected Areas such as Sydney Harbour and some zones within aquatic reserves and marine parks. Alter the length of an invertebrate by shucking and/or removing the head/shell until well away from the water. This rule does not apply at areas normally used for cleaning fish such as boat ramp cleaning tables, if the fish are for immediate consumption or immediate use as bait, or for fish that do not have a legal length.